You just spent six months rent on one fine-looking guitar. Now, why are you going to lug it around in a gig bag that offers the protection of Saran Wrap? Better check out Yamaha's new Virtuoso series of gig bags. Designed for both guitarists and electric bassists, these are high-quality bags, loaded with features for any musician's traveling needs. 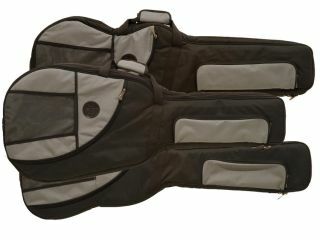 The Virtuoso gig bags come with Yamaha's exclusive Air Cell, pads on backpack-style straps for increased comfort. It offers self-repairing zippers with custom zipper pulls, thick interior padding, an outer shell made from tough 600 denier material, designer webbing and two accessory pockets with a bonus net pocket for tools and strings. Available in an attractive black and gray color scheme, the Virtuoso series offer three different models: the YBVAG fits acoustic guitars and oversize electric guitars, the YBVEG is designed for most solid-body electric guitars and the YBVEB accommodates the large dimensions of electric bass guitars. Prices for the Virtuoso series gig bags are pending. For more information, visit the official Yamaha website.